HUNTINGTON, W.Va.-Marshall Football opened Conference USA play against Southern Miss and roared back from a 14-point deficit to defeat the Golden Eagles 26-20 Saturday evening at Joan C. Edwards Stadium. 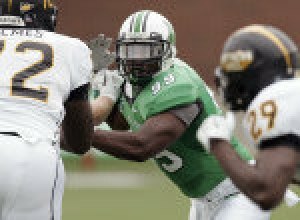 Marshall fell behind 17-3 in the first half, but a three touchdown performance from quarterback Rakeem Cato, and two touchdown receptions from wide receiver Aaron Dobson helped push the Thundering Herd to a 26-20 win, giving Marshall their first win of the season. The victory gives Marshall a 1-1 (1-0 C-USA) record on the season, while Southern Miss drops to 1-1 (0-1 C-USA) with the loss. Cato made the second start of his career at the quarterback spot for the Herd and finished 27-42, with two interceptions. The freshman totaled 275 yards and three touchdowns. His favorite target, Dobson, had seven catches and 69 yards with two touchdowns on the day. Defensively, Vinny Curry, the preseason Conference USA Defensive Player of the Year proved why he is one the premier defensive ends in the country after recording three sacks, including a sack on the very first offensive play for the Golden Eagle offense, and 4.5 tackles for a loss. Curry's opening sack for an eight-yard loss helped the Herd get the ball back following the Marshall punt and Cato put together a string of aerial completions to get to the USM 15-yard line, but two narrowly missed attempts in the end zone set up a 32-yard field goal for Tyler Warner to get the first points of the game and go up 3-0. On the ensuing drive from USM, the Golden Eagles drove for five consecutive first downs, three of them being on a third down situation. After getting the ball to the MU 13-yard line, USM quarterback Austin Davis threw a 13-yard touchdown to Francisco Llanos to put the Golden Eagles ahead 7-3. With the touchdown pass, Llanos passed Brett Favre in the record books in total career yards with 7,702, surpassing Favre's previous record of 7,695. Davis would finish the game with 309 yards and a total of 7,991 career yards. The Herd got the ball back with 1:15 left in the quarter and started the second quarter having to punt from their 21. After a 13 yard return by Tracy Lampley, USM started from their 41. Davis continued to be magic on third down after converting two third-and-12 situations with completed passes and set up the ball on Marshall's ten yard line. The Marshall defense stone-walled the USM momentum and stayed strong on the goal line after George Carpenter helped push the Golden Eagles back to the 18 with a seven yard sack. USM put three more points on the board, with a 36 yard field goal, following the sack to put the score at 10-7. The USM defense forced a three-and-out on the following offensive series of the Herd and Marshall punter Kase Whitehead started what would be a trend of placing the ball inside the 5-yard line. With the Golden Eagles with their backs to their own end zone, Davis shocked the Marshall faithful with a 90-yard touchdown throw to Llanos for the pair's second touchdown. USM pushed their lead to 14 with the reception that would turn out be the third longest pass in SMU history. The USM drive recorded 96 yards in 15 seconds. Following punts from Southern Miss and Marshall in the following drives, Marshall took over possession with 1:56 left in the first half. Cato led the Herd to the ten yard line after completing two passes and having Travon Van earn a 7 yard gain for a first down. Facing second and goal, Cato threw a fade route to Dobson who made a tremendous catch despite pass interference to score for the Herd and make the score 17-10 USM before entering halftime. USM opened the second half at the 23 yard line but Marshall linebacker George Carpenter forced and recovered a fumble, giving the ball back to the Herd. Carpenter finished with a team-leading 13 tackles, including one sack and two tackles for a loss. He also had a forced fumble and two fumble recoveries. The Herd would capitalize on the Golden Eagle turnover and Cato used the momentum to throw his second touchdown pass of the game to tight end Gator Hoskins for an 11-yard touchdown, tying the game 17-17. The reception was the first career touchdown for the sophomore. The Herd offense scored off a Cato-to-Dobson combination again, this time via a 17-yard toss, putting the Herd up for the first time since early in the first quarter, 24-17. USM looked to respond and started at the 26-yard line and had control of the ball when the third quarter ended. Marshall was forced to punt on the ensuing drive, but pinned USM yet again, putting the Golden Eagles on the one yard line. With USM's backs against their own end zone again, the Herd didn't let them escape this time and Curry stuffed Kendrick Hardy's rush in the end zone to give Marshall a safety. The two points expanded Marshall's lead to 26-17, which was the first Herd safety since Sept. 22, 2007 against Cincinnati. The score remained the same until there was 2:34 left on the clock and Southern Miss took the ball at their own 39. Davis led the Golden Eagles on a 50-yard drive and setup a 28-yard field goal from kicker Danny Hrapmann that cut the Marshall lead to 26-20. Only trailing six points and with 1:22 left for USM to score, Hrapmann placed a trickling onside kick straight between the hashes and USM came up with the ball after it bounced over the 10-yard limit. With no timeouts left, USM incorporated their hurry up offense. The Marshall defense stiffened, however, and secured the win after cornerback Monterius Loevett picked off Davis' pass on third and 10. With the win secured, the Marshall victory formation kneeled the ball for the Herd's first victory of the season. On the ground, Tron Martinez finished with the most rushing yards with 69, while USM's Jamal Woodyard had the most for the Golden Eagles with 54. Dobson's 69-yard performance in the air was the best on the team and Llanos led USM with 132 reception yards and two touchdowns. Whitehead played a vital role in field position after pinning down five punts inside the ten yard line. Defensively, linebackerKellen Harris and Tyson Gale followed Carpenter's 13 tackles with nine of their own and safety Omar Brown had eight. The defense finished with five total sacks for 37 yards lost and 11 tackles for loss with 51 yards. Marshall also beat USM in the turnover margin, forcing six Golden Eagle miscues, while committing just two themselves. The Herd also sacked Davis five times. The Herd will be on the road against border rivals, Ohio, for next week's game at 7 p.m. ET Saturday at Peden Stadium.